Acknowledged author Theodore E. Brown wrote Chemistry: The Central Science comprising 1248 pages back in 2017. Textbook and etextbook are published under ISBN 0134414233 and 9780134414232. 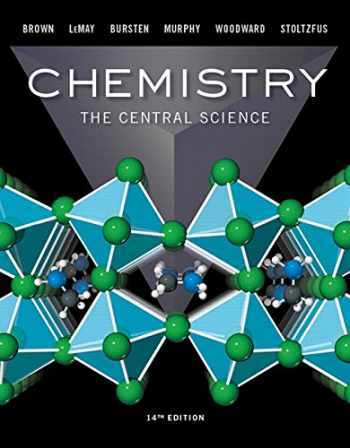 Since then Chemistry: The Central Science textbook received total rating of 4.5 stars and was available to sell back to BooksRun online for the top buyback price of $62.17 or rent at the marketplace. For courses in two-semester general chemistry. Accurate, data-driven authorship with expanded interactivity leads to greater student engagement Unrivaled problem sets, notable scientific accuracy and currency, and remarkable clarity have made Chemistry: The Central Science the leading general chemistry text for more than a decade. Trusted, innovative, and calibrated, the text increases conceptual understanding and leads to greater student success in general chemistry by building on the expertise of the dynamic author team of leading researchers and award-winning teachers. In this new edition, the author team draws on the wealth of student data in Mastering™ Chemistry to identify where students struggle and strives to perfect the clarity and effectiveness of the text, the art, and the exercises while addressing student misconceptions and encouraging thinking about the practical, real-world use of chemistry. New levels of student interactivity and engagement are made possible through the enhanced eText 2.0 and Mastering Chemistry, providing seamlessly integrated videos and personalized learning throughout the course . Also available with Mastering Chemistry Mastering™ Chemistry is the leading online homework, tutorial, and engagement system, designed to improve results by engaging students with vetted content. The enhanced eText 2.0 and Mastering Chemistry work with the book to provide seamless and tightly integrated videos and other rich media and assessment throughout the course. Instructors can assign interactive media before class to engage students and ensure they arrive ready to learn. Students further master concepts through book-specific Mastering Chemistry assignments, which provide hints and answer-specific feedback that build problem-solving skills. With Learning Catalytics™ instructors can expand on key concepts and encourage student engagement during lecture through questions answered individually or in pairs and groups. Mastering Chemistry now provides students with the new General Chemistry Primer for remediation of chemistry and math skills needed in the general chemistry course. Note: You are purchasing a standalone product; Mastering™ Chemistry does not come packaged with this content. Students, if interested in purchasing this title with Mastering Chemistry , ask your instructor for the correct package ISBN and Course ID. Instructors, contact your Pearson representative for more information. If you would like to purchase both the physical text and MyLab & Mastering, search for: 0134292812 / 9780134292816 Chemistry: The Central Science Plus Mastering Chemistry with eText -- Access Card Package Package consists of: 0134294165 / 9780134294162 Mastering Chemistry with Pearson eText -- ValuePack Access Card -- for Chemistry: The Central Science 0134414233 / 9780134414232 Chemistry: The Central Science Mastering Chemistry should only be purchased when required by an instructor.